Welcome to Part III of the Edmodo series. Edmodo has become an active part of my classroom. This has allowed us to become a virtually paperless class. Students are able to submit all work through Edmodo to me. I can view it, score it, and provide comments and feedback. There are even features that students can use that send a text message to them when new assignments are posted, alerts, polls, or any other element they wish to be notified about immediately. Here is a picture of the my home page. Notice the controls at the top. I can access all grades, view my classes in isolation, read messages posted just for me, delete information, and basically control the entire setting. This is an invaluable tool for any classroom. Using the picture above as a guide, let’s look at some of the useful components of this application. In the picture above, the orange circle is where I go to view grades. I can see who is missing assignments, and record a score for each student. The student pages offer the same function, but just for the student who is logged in. If you notice the yellow line, this is an example of an assignment that I posted. This is how it looks to students. I included a due date, and directions. My screen shows me that even though this assignment is not due until January 31, nine students have already submitted this. The black arrow points to my groups. These are the groups that I have created or joined. My three groups are listed there. If a student has more than one teacher on Edmodo, they simply join each teacher’s group. They can easily navigate between the groups. The happy face is labeled that way because this is the section of Edmodo that will make your life happier and easier! This is the area where you post any messages! Create polls, add links, attach your media (maybe a Prezi? 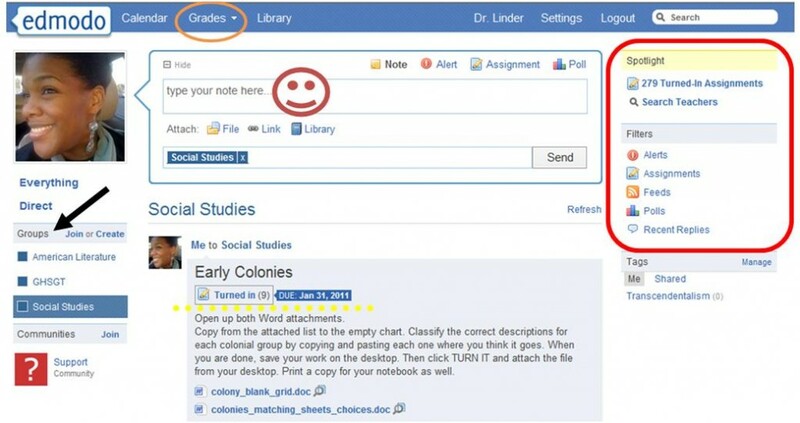 ), create assignments, and reply to peers and students within Edmodo. This is the center of your Edmodo operation! Finally, you have the red box on the right side of the screen. This is what Iconsider an update area. It shows how many assignments have been submitted (I have quite a few) for all of your groups, any new replies, or posts can be quickly accessed here as well. You are also able to view only assignments, polls, or any area that you wish to view in isolation. I hope this helped get you interested in using Edmodo. If you do, please search for my name (the red box) and send me a message. I would love to hear of your Edmodo adventures! I like the approach and time you spend explaining this! I do have one question. How can you add a team teacher? What if you BOTH want to have access to a class? It is pretty easy. Both teachers join Edmodo as teachers. On of you sets up your groups for the classes. The other teacher just clicks JOIN (under your profile pic) and types in the code, just like your students do. They are instantly in the group. Once they join the group, the teacher can just go to the members section for any group and change their status from teacher to co-teacher. This allows as many teachers as you want to have the ability to grade and control all of the same functions as the original teacher who started the group. Nice site! How can I get the RSS feed to it? Hello man! Amazing blog! I really enjoyed being here. I love Prezi. Just last week I assisted a high scohol History class in collaborating with Prezi. They loved being able to see what area of the presentation the other students were working on by seeing the avatar on the screen. By itself Prezi is a very strong presentation tool, but combined with the collaboration makes it even better. We also have a couple of 3rd grade teachers that are using Prezi with their classes and those students can’t wait to have computer lab time so they can get to work.I’ll have to check out Zoho Show, as I haven’t seen that one before. Thanks for sharing, and thanks for checking out my blog as well!